A five-month-old girl has died after being attacked by two Rottweiler guard dogs in Leicester. Police say the dogs, which attacked the girl in the living quarters of The Rocket pub in Stephenson Drive, New Parks, have been put down. It is thought her parents had been looking after the pub and the animals while the landlord was on holiday. The girl was taken to Leicester Royal Infirmary on Saturday afternoon where she later died from her injuries. Police have begun an investigation to try to find out what happened. 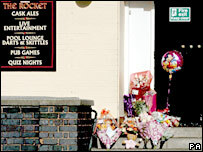 Flowers and teddy bears have been left in the doorway of the pub which has been closed since the incident. Neighbour Amy Grimbley said: "The dogs are known to be vicious. They stay on the roof during the day and whenever you walk past, you get the feeling they could jump down and attack you. "The dogs are very aggressive. Everybody around here is petrified of them." She added: "There's a school opposite the pub and nobody is happy walking their kids past the pub after school. I've got a three-year-old and I don't feel at all safe walking past them." Ms Grimbley's father, James, said: "Our hearts go out to the parents of that poor baby. Everybody is so shocked at what has happened. "Everybody is talking about it. Nobody can believe it."